Ojibwe oral history and archaeological records provide evidence that the Ojibwe moved slowly in small groups following the Great Lakes westward. By the time the French arrived in the Great Lakes area in the early 1600s, the Ojibwe were well established at Sault Ste. Marie and the surrounding area. An Ojibwe prophecy that urged them to move west to "the land where food grows on water" was a clear reference to wild rice and served as a major incentive to migrate westward. Eventually some bands made their homes in the northern area of present-day Minnesota. The most populous tribe in North America, the Ojibwe live in both the United States and Canada and occupy land around the entire Great Lakes, including in Minnesota, North Dakota, Wisconsin, Michigan, and Ontario. The seven Ojibwe reservations in Minnesota are Bois Forte (Nett Lake), Fond du Lac, Grand Portage, Leech Lake, Mille Lacs, White Earth, and Red Lake. The name "Ojibwe" may be drawn from either the puckered seam of the Ojibwe moccasin or the Ojibwe custom of writing on birch bark. The Ojibwe have always hunted and fished, made maple sugar and syrup, and harvested wild rice. Prior to the 20th century, the Ojibwe lived in wigwams and travelled the waterways of the region in birch bark canoes. 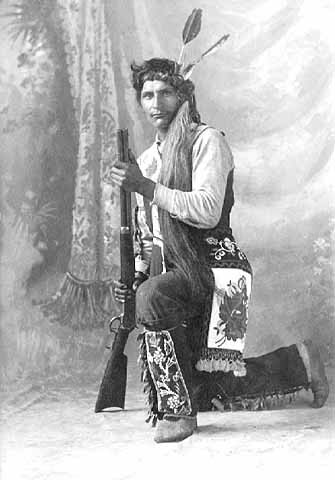 Ojibwe communities were historically based on clans, or "doodem," which determined a person's place in Ojibwe society. Different clans represented different aspects of Ojibwe society; for example, political leaders came from the loon or crane clans, while warriors were traditionally from the bear, martin, lynx, and wolf clans. Ojibwe theology centers on a belief in a single creating force but also incorporates a wide pantheon of spirits that play specific roles in the universe. Throughout the fur trade era, the Ojibwe valued their relationship with the Dakota above those they maintained with European Americans. While historians have frequently cited ongoing conflict between the Ojibwe and Dakota, the two peoples were more often at peace than at war. In 1679 the Ojibwe and the Dakota formed an alliance through peaceful diplomacy at Fond du Lac in present-day Minnesota. The Ojibwe agreed to provide the Dakota with fur trade goods, and in return the Dakota permitted the Ojibwe to move west toward the Mississippi River. During this period of peace that lasted for 57 years, the Ojibwe and Dakota often hunted together, created families together, shared their religious experiences, and prospered. From 1736–1760, intense territorial conflict between the Ojibwe and Dakota brought them into deadly conflict. 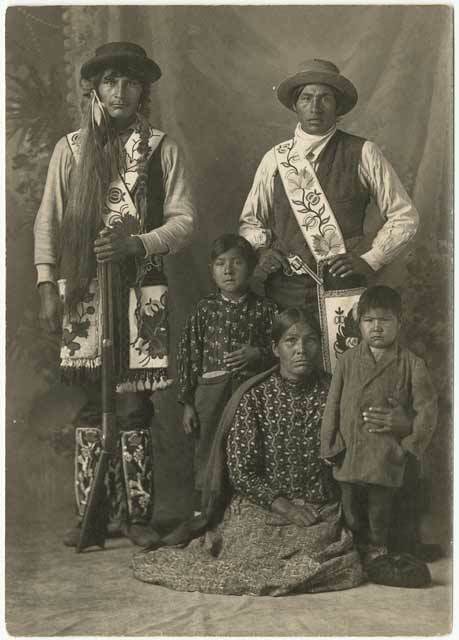 By the middle of the 1800s, intertribal conflict was abandoned as both tribes were overwhelmed by challenges posed by the surge of European American settler-colonists. For the Ojibwe, the confluence of the Mississippi and Minnesota rivers was a place of diplomacy and trade. They met with Dakota people at Mni Sni (Coldwater Spring) and after European Americans arrived, they frequented the area to trade, treat with the US Indian Agent, and sign treaties. Ojibwe delegations gathered at Fort Snelling in 1820 to meet with local Dakota leaders and in 1825 before traveling to Prairie du Chien for treaty negotiations. In 1837 more than 1,000 Ojibwe met Dakota and US representatives at the confluence to negotiate another treaty. The Ojibwe forced a rare provision into the Treaty of St. Peters, retaining the right to hunt, fish, gather wild rice, and otherwise use the land as they always had. The collapse of the fur trade economy, land dispossession through treaties, and the creation of reservations dramatically altered Ojibwe lives and left them with a small portion of their original homelands at the end of the 1800s. 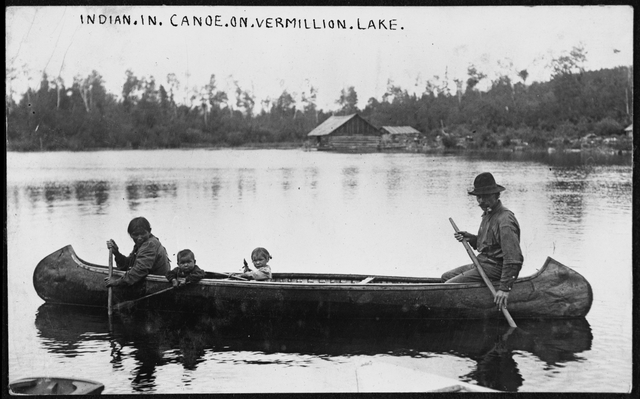 Unidentified Ojibwe family in canoe at Vermilion Lake, about 1905. Unidentified Ojibwe family in canoe at Vermilion Lake, about 1905. Source: MNHS Collections. "Ojibwa Portaging Around the Falls of St. Anthony," oil on canvas by George Catlin, 1835–1836. 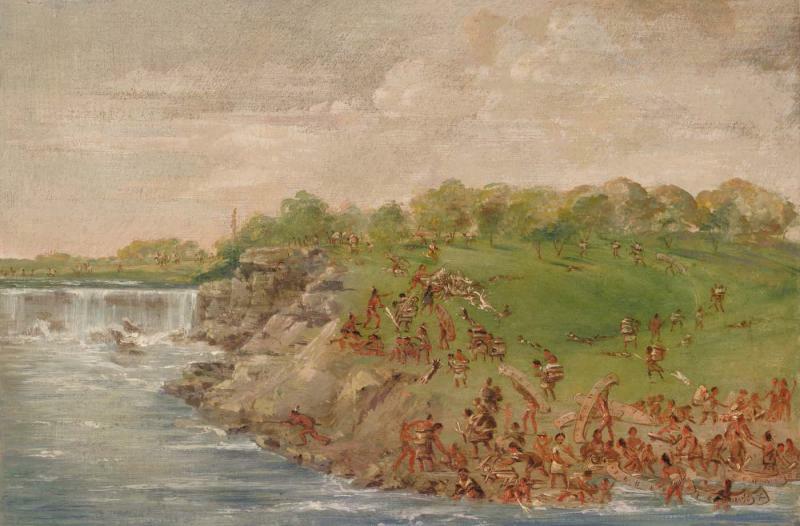 "Ojibwa Portaging Around the Falls of St. Anthony," oil on canvasCourtesy of the Smithsonian American Art Museum. 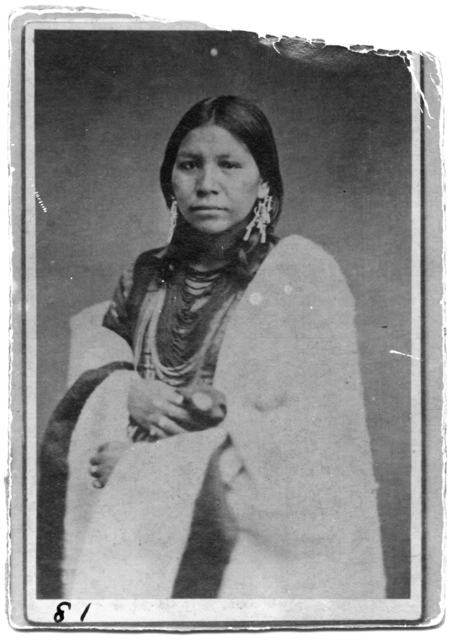 Unidentified Ojibwe woman, about 1885. Unidentified Ojibwe woman, about 1885.Source: MNHS Collections.